What is the One.com Staging plugin? Where can I activate the One.com Staging plugin? How do I create a staging environment? Where can I edit and view my staging site? How do I move my staging site to my live site? How can I rebuild or delete my staging site? 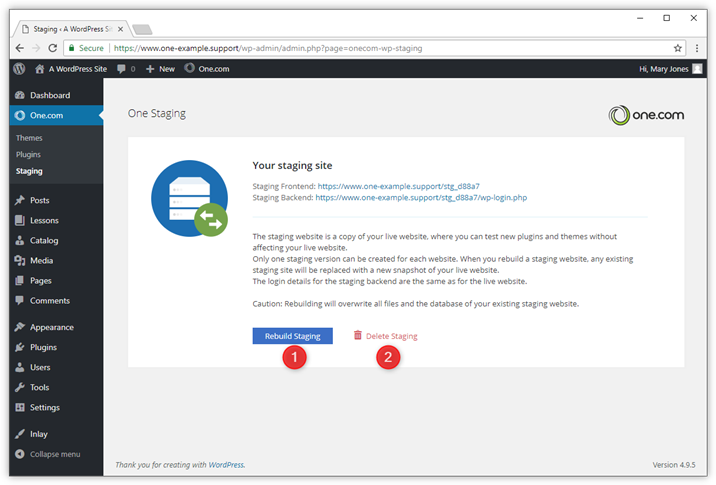 You can use the One.com Staging plugin to try out changes on your WordPress site, without it affecting your live site where your visitors might notice this. 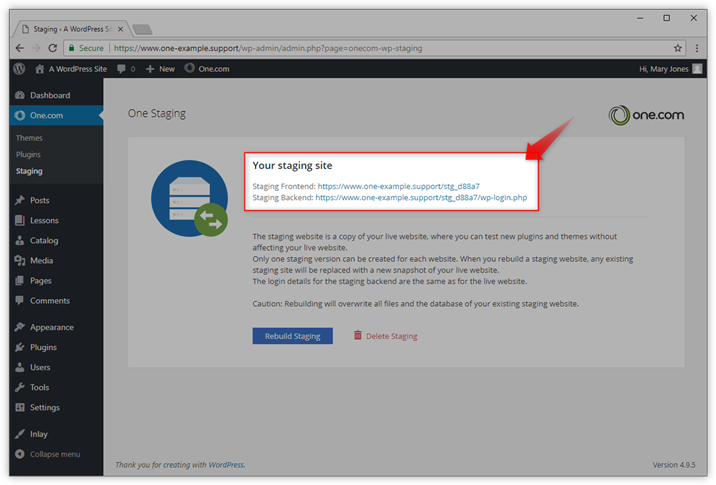 The staging plugin creates a copy of your site in a randomly created location on your web space, where you can try out plugins, themes or other changes. If something goes wrong, like a plugin that doesn't work as intended, you can simply rebuild the staging site and import a copy of your live website again. When you are happy with the result, you can copy the staging site to the live version of your site to make it visible to your users. That's all! 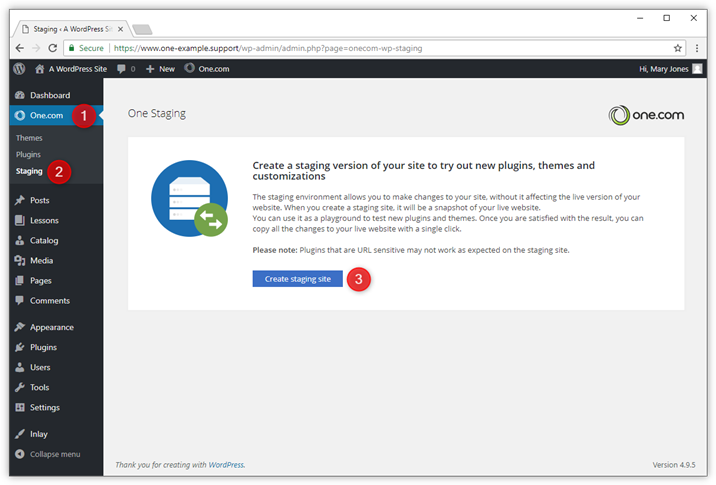 The Staging plugin is included with the One.com parent plugin. You can find it in the WordPress dashboard in the menu to the left. It is activated by default when the parent plugin is installed. Can't find the One.com parent plugin in your WordPress dashboard? Check out our guide on how to install it manually: How do I install the One.com parent plugin? Go to the One.com plugin in your WordPress dashboard. Click Staging in the dropdown menu. Click the button Create staging site. Staging frontend - here you can view your staging site, and any changes you have made. Staging backend - your staging WordPress dashboard, where you can edit your site. Click either link to open it. How do I copy my staging site to my live site? You can copy your staging site to your live site from the staging backend. You can recognize the staging backend on the green bar at the top of the screen. In your live site, this bar is black. 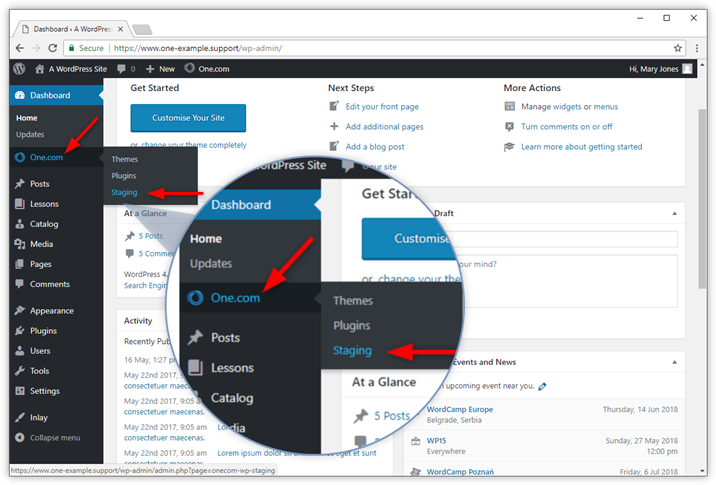 Go to the One.com plugin in your staging WordPress dashboard. Click the button Copy staging to live. 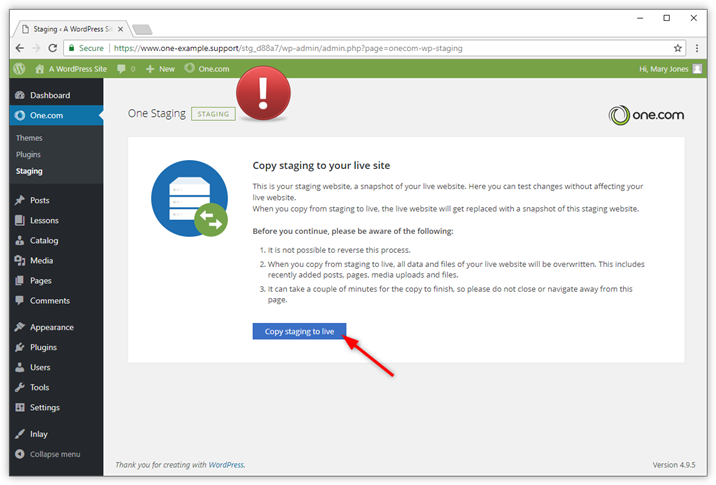 Rebuild staging - this option creates a fresh copy of your live site and deletes your existing staging site. Delete staging - this option only deletes your staging site. We recommend that you delete your staging site when you no longer need it. Leaving it would make your site more vulnerable to hacks because it doesn't get updated.